We were requested recently to comment on statement of creed issued by a person named Asrar Rasheed of Birmingham, who is an Ash'ari / Maturidi in creed (the word "Ash'ari" is an umbrella term that includes the Maturidis, that's how most Maturidis themselves see it). A scan of a statement of creed written by this individual was sent to us on 5th April 2011. We have no idea when it was written, but we commenced responding to it on 14th April 2011. In the commentary upon this statement, we will come to realize how today's Ash'aris do not really differentiate between the early Kullabi Ash'aris (who were much closer to Ahl al-Sunnah) and the Later Ash'aris who reverted to many of the positions of the Jahmiyyah and Mu'tazilah in the sifaat, and left the way of al-Ash'ari. At the same time, these contemporaries deceive themselves into thinking that what they are upon is the way of the Salaf, when the reality is that they are not even upon the creed of Ibn Kullaab and al-Ash'ari and his early students (the Kullaabi Ash'aris), let alone the way of the Salaf. Further, when they present their creed, it is presented in a deceptive manner using generalizations and vagueness, and the avoidance of any specificity and detail so as to allow a false ascription to the Salaf to be made in front of the audience. Whilst there are lots of other articles on this site that are also important and beneficial, these two sets of articles will give you the best comprehension of the entire subject matter and give you an good overview of the deen of the Ahl al-Kalaam and their various offshoots. With this background information, you will better comprehend this series of articles. Note: It is not our intent to bring extensive quotations and discuss particular issues in detail, because all of the background knowledge and detailed discussions have already been covered in other articles. Equipped with that knowledge, it becomes very easy to identify Tajahhum and its practitioners and see their errors, mistakes and deceptions in their speech and writings. So all we will be doing in these articles is to make pointers. Before we start commenting on his statement, we should clarify that all of those we have addressed previously on this site have been proven to be dishonest, conniving, calculated people, whose lies are plain and manifest to see to anyone with even an ounce of sincerity and the desire for seeking truth. These are people like Zubair (see here), Abu Adam Naruiji (see here), the Philadelphian Jahmites (see here), the Ma'rifah blind-followers (see here), the pretender Abu Layth (see here), the deceiver Abdullah Ali al-Amin (see here), GF Haddaad and his babies, Faqir et. al. (see here, and also here), Nuh Keller (see here and also here), also Hamza Yusuf (see here) and others. So Allaah knows best about Asrar Rasheed how he will behave after the hujjah is established upon him that his orientation in creed (coming from the Ash'ari Maturidi schools) is founded originally upon a matter that the Salaf condemned and vilified, namely the blameworthy ilm al-Kalaam which is the language of al-ajsaam and al-a'raad which he is trying so desperately to hide. What we find in practice is that as it becomes increasingly clear that the later As'haris had little to do with Abu al-Hasan al-Ash'ari himself and lost connection with him and that the Maturidis, from the very outset, were closer to the Mu'tazilah in creed than they were to the early Kullaabi Ash'aris, these people became more shrewd and more adept in the way they formulate and present their creed to the masses so as to conceal many things (by ommission) and to give the false picture that they are following the Salaf by maintaining policy of speaking in generalizations devoid of tafseelaat (details). Allaah, the Sublime, has negated from Himself any mithl (likeness) for Him and any shabeeh (resemblance) with Him, and He emphasized that, and did not just say, "laysi mithlihi shay", "There is no likeness unto Him." But [the addition of the kaaf before "mithl"] contains a strengthening of emphasis in negating anything that is a likeness (matheel) to Him or has resemblance (shabeeh) with Him. Hence, there is no mumaathalah (likeness), and no mushaabahah (resemblance) between Him, the Sublime and Exalted, and between His creation. He does not resemble them, and nor do they resemble Him, with a negation of (resemblance) that is general, from all angles. Everything that the imaginations and thoughts conceive of, then Allaah, the Sublime and Exalted is different to it. First: This speech in this paragraph is correct in and of itself with the exception of one matter discussed further below. However, the reader should keep in mind that that after centuries of deception, the Ahl al-Kalaam have become very adept at using general phraseology and language that appears to be identical to the madhhab of the Salaf so they can give the impression their methodology in aqidah is the methodology of the Salaf, and they can maintain this illusion by avoiding going into tafseelaat (specifics). What the Ahl al-Kalaam intend by negation of tamtheel, tashbeeh is not synonymous with what Ahl al-Sunnah, the Righteous Salaf, intend by this, because Ahl al-Sunnah have entered the house from its proper entrance, whereas Ahl al-Kalaam have entered the house from other than its proper place, they simply followed, in their theology, what the Hellenized nations fell into (the Jews, Christians and Sabeans who used the conceptual tools of the Greeks, al-ajsaam wal-a'raad, in their theology), and we have remarked about this in previous parts so refer to them for the details. And if you mean by the mushabbih, the one who says that Allaah, the Exalted, resembles His creation from some angles, then this does not necessitate kufr (disbelief) because the Muslims are agreed that Allaah exists (mawjood) and is a thing (shay'), and knowing (aalim), able (qaadir), and the animals (al-hayawaanaat) are like that too, and that does not necessitate kufr. And if you mean by the mushabbih, the one who says that al-Ilaah (Allaah) is a body (jism) in a specific place, then we do not accept that a consensus has been established upon the takfeer of the one who says that, rather it is [only] a claimed consensus in a matter of dispute, so it is not turned to. To deny resemblance, from every single angle, absolutely, necessitates the denial of everything that Allaah is described with, and this absolution is the foundation of the deen of the Jahmiyyah and Mu'tazilah regarding the sifaat, and upon it they argued against the early Kullaabi Ash'aris who had a good response to them (see further below). The truth is that the denial of mithl and matheel and mumaathalah (i.e. likeness) is absolute, and as for mushaabahah, (resemblance) there is resemblance from certain angles in that Allaah is said to exist, have life, have knowledge, speak, hear, see and so on and His creatures also have life, knowledge, and can hear, see and speak. So this is resemblance from an angle. Further, there is a degree of commonality in the base meaning in the attributes shared between Allaah and His creation, like those mentioned as examples, life, knowledge, will, hearing, seeing and so on. If this had not been the case, it would be completely impossible to know anything about Allaah, the Exalted. Hence, when we say Allaah has knowledge, then we only understand what it is we are affirming for Allaah in meaning because we already have an idea of the meaning of "knowledge" from what we have experienced, and whilst there is a degree of commonality in the foundational, base meaning of "knowledge" (which allows us to affirm something for Allaah beyond mere collections of letters) how that knowledge is with Allaah and how He knows, and the reality of His knowledge is unknowable and unfathomable and does not resemble the reality of the attribute of knowledge as found in His creatures. If you grasp this matter, you will fully grasp the great mistake of these people (the Ahl al-Kalaam, and in particular the Ash'aris and Maturidis) in denying much of what Allaah has affirmed for Himself. We see in the Qur'an Allaah describe Himself as al-Hayy (living) (2:255) and the creation as also living (al-hayy) (30:19), and He describes Himself as Aleem (knowing) and Haleem (forbearing) and He described the sons of Ibraaheem (alayhis salaam), as aleem and haleem (see 51:28, 37:101). And He described Himself as Samee' Baseer (hearing, seeing) and mankind as samee', baseer (see 4:58, 76:2). And likewise Allaah is Ra'oof, Raheem (Compassionate, Merciful) and He described the Messenger as ra'oof, raheem (see 2:143, 9:128), and the same can be said about Malik, Mu'min, Azeez, Jabbaar, Mutakabbir, all of these are used by Allaah for Himself and for His creation. And as for attributes we see ilm (knowledge), quwwah (strength), ayd (strength, power), mashee'ah (will), iraadah (wish), mahabbah (love), ridaa (pleasure), maqt (hatred), makr (plotting), 'amal (action), munaadaah (calling out), munaajaah (private conversation), takleem (speaking), tanbi'ah (informing), ta'leem (teaching), ghadab (anger) - all of these are mentioned for both Allaah and His creation in the Qur'an. And then we see also, istiwaa (ascending), yadaan (hands), wajh (face) mentioned for both Allaah and His creation in the Qur'an, and there is more that is in the Sunnah. And there is no doubt that whilst we understand universal meanings for all of these things, their actual external realities only apply when idaafah (ascription), and takhsees (specification) is made, as in when we say "Allaah's knowledge" and "man's knowledge" and "Allaah's Pleasure" and "man's pleasure", so when this ascription and specification is made (of a universal meaning to an entity), the realities differ, even though there is a degree of commonality in meaning in the terms "knowledge" and "pleasure" (no matter to whom they are applied to) and the same applies to all other names and attributes. In other words, we have a universal meaning in the term "knowledge", and when we say "Allaah's knowledge" we have moved from that universal meaning to specification, and when we say "man's knowledge" we have moved from a universal meaning to another specification, and while the specifications are different, we still have a base, common element in the meaning that we have affirmed in both specifications, and affirming this for Allaah and His creation, does not in any way necessitate tamaathul (likeness) or mushaabahah (resemblance) in the realities of these specifications, since with respect to Allaah, they are unknown to us. So for this reason we have absolutely no caution in affirming life, knowledge, will, hearing, seeing, face, hands, anger, pleasure, istiwaa and so on for Allaah, because, upon what has just been mentioned, there is not and cannot be any tashbeeh necessitated. This is the foundation of the ithbaat (affirmation) of the Salaf. And had this not been the case, then we would not be able to have any knowledge of Allaah whatsoever, and affirming anything at all for Allaah would automatically count as tashbeeh. But Ahl al-Sunnah treat everything upon a uniform principle, and they derive their speech about Allaah from the revealed texts and you see complete coherence and conformity in what they are upon and in their principles. But as for the Ahl al-Kalaam, they are confused, contradictory and do not have any coherence at all, because the principles they operate upon in speech about Allaah are derived from the conceptual tools of the Hellenized nations primarily (the discussion of al-ajsaam wal-a'raad), and they consider their conclusions based upon this foreign knowledge and philosophy to be superior to the affirmations in the revealed texts (aql over naql) as is explicitly elaborated upon by Fakhr al-Deen al-Raazee in his universal principle (al-qaanoon al-kullee) in his book Asaas al-Taqdees where he clearly says that if reason conflicts with revelation, reason comes first. And if someone said: What has led you to deny that His Face and Hand is a limb when you do not understand hand as an attribute, and face as an attribute except [in the form of a] limb? It is said to him: That is not necessitated, just like it is not necessitated when we do not understand a living, knowing, able (being) except to be a body (jism) that we, us and you, should judge Allah with the same. And just like it is not necessitated when He is established by His own Essence (qaa'iman bi dhaatihi) that He is substance and body just because we, and you, do not find anything established by itself (qaa'imun bi-nafsihi) in what we (outwardly) observe except that it is like that (i.e. Substance and body). Issue: And it is said to them: What has led you to reject that Allāh, the Exalted meant two hands by His saying, "With my two hands (biyadayya)" (38:75) and not two favours? If they say: Because if al-yad (hand) is not [with the meaning of] favour (niʿmah) then it is but a limb (jāriḥah). It is said to them: Why have you judged that if hand is not favour, then it is but a limb? ... They said: al-yad (hand), when it is not favour in what is observed, it is but a limb. It is said to them: If you are working [on the basis] of what is observed [in creation] and you judged Allāh by way of it, then likewise, we do not find any living thing (hayyan) in the creation except as a body, flesh and blood. So judge Allāh with that (too) [i.e. as He is also living], exalted is Allāh from that. And if not then you are [obliged] to abandon your saying because you are contradicting your very own justification [in argument]. And if you affirm [one who is] living but not like the living [creatures], then what has led to you reject that He has two hands which Allāh, the Exalted informed about, which are neither two favours nor two limbs, and nor like the hands [of the creatures]. Likewise, it is said to them: We do not find any mudabbir (controller), hakīm (wise), except as a human, but then you affirm that the world has a mudabbir and ḥakīm who is not like a human, and you opposed what is observed [in the creation] and you contradicted your own justification [in argument against us]. Therefore do not prevent from the affirmation of two hands that are not two favours or two limbs for the reason that it is opposed to what is observed. Note: What Abu al-Hasan al-Ash'ari intends here is: Don't deny the affirmation of two hands for Allāh upon the argument that if they are not two favours and not two limbs, then this opposes what is observed in creation, since we only know in what is observed, either hand as "favour", or hand as "a limb". 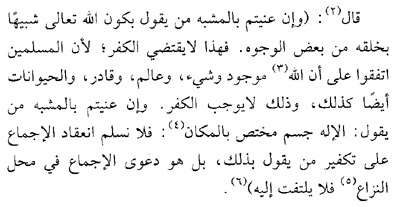 So al-Ashʿarī is refuting this argument of the Muʿtazilah and explains that you are in contradiction when you affirm other matters for Allāh, because the same argument equally applies there as well, since we only know of other meanings established for Allaah through the manifestation of these meanings in man, however, it is not necessitated that the realities associated with these meanings are the same. What you see in the speech of al-Baqillaani and al-Ash'ari is an argument founded upon the reality we have already spoken about in the earlier points regarding the nature of language and meaning and thus we distinguish between universal concepts in the mind and the external realities associated with them, and thus with regard to the universal concepts in the mind (which are captured, identified and communicatetd through words), there must be a degree of commonality in the foundational, base meanings (between Allaah and His creation), otherwise it would be impossible for Allaah to communicate knowledge to us by which the hearts know Him, love Him and yearn for Him. However, as for the realities (haqaa'iq) of the attributes, they are appropriate to the one being described. Thus, the creation have life, knowledge, will, hearing, seeing, face, hands, anger, pleasure in a way that is appropriate to them and their essences and Allaah, the Exalted has life, knowledge, will, hearing, seeing, face, hands, anger, pleasure in a manner that befits His essence (which is unlike all other essences), and the only thing we are obligated with is to affirm what Allaah affirmed for Himself and negate any mithl (likeness) from Him and to negate resemblance from Him in the reality of His attributes, not in the base foundational meanings, in which there has to be some degree of commonality, otherwise, it is not possible for the Ash'arites to affirm any attributes at all and they would have to deny all attributes to avoid tashbeeh, and would have to take the stance of the deniers of the attributes outright, like the Mu'tazilah, in order to remain coherent in their argument. Fourth: From the above, we see that this absolution in the statement of Asrar Rashid is incorrect, and it is a mistake even according to the statement of al-Razi in what is related from him, as has preceded. Fifth: As for Asrar's final statement, "Everything that the imaginations and thoughts conceive of, then Allaah, the Sublime and Exalted is different to it," then this is approximate to what al-Tahawi has mentioned at the beginning of his creed, and this relates to the haqaa'iq (realities) of what Allaah is described with, but as for the meanings, then when the mind thinks of Allaah having knowledge, and life, and wish, and hearing, and seeing, and so on, then the mind can certainly reach and grasp a foundational element of these meanings, but not the realities associated with them as they exist with Allaah the Exalted. This is becauses fathoming and grasping something can only occur through one of three ways: a) seeing it directly, b) seeing its like or c) being informed of a trustworthy one with sound knowledge of it. As for the first two, they are impossible with respect to Allaah, and as for the third, then it is whatever knowledge Allaah reveals to His Prophets and Messengers about Himself who convey it. And it is through this knowledge that the hearts and minds know of Allaah as living, knowing, hearing, seeing, speaking, generous, wise, merciful and so on with all the other attributes. So they know and grasp something of meaning, as a result of which their hearts know Him and love Him and yearn for Him, which shows that this revealed knowledge is the very foundation of the worship of Allaah, the Exalted. But as for the haqaa'iq (realities) then whatever the imaginations and understandings (intellects) try to conceive, imagine and think of, then Allaah is different to it. And all of this is in perfect accord with the position of the Salaf which is to make ithbaat with negation of tamtheel and takyeef. As for the Ahl al-Kalaam, then they fall into confusion and discrepancy and they cannot follow a uniform principle in this regard, and suffice it as proof that the Jahmiyyah differ with the Mu'tazilah and the Mu'tazilah differ with the Ash'ariyyah, yet the creed of all of them is founded upon the same ilm al-Kalaam which is the proof of huduth al-ajsaam based upon the conceptual tools and language of the Hellenized nations (Jews, Christians and Sabeans) who preceded them in this particular ilm al-Kalaam which we established and proved beyond doubt in this series of articles (on Aristotle, Philo Judaeus, Augustine, the Sabeans, the Mu'tazilites and the Ash'arites). Sixth: Asrar Rasheed is not following the way of the Salaf, he is lying in his claim, rather he is following the Ahl al-Kalaam, and all he has done is to make vague general statements which are mostly based around negation of tamtheel, Tajseem, tashbeeh and so on, in order to give the illusion he is following the Salaf, and avoided committing himself to specific ithbaat. However, as we said in a previous article, there is no escape from mentioning at least something besides the generalizations (even if it is just hinted at) otherwise, the statement of creed would be meaningless to anyone who reads it, and for this reason we see that he addressed the issue of the sifaat khabariyyah dhaatiyyah in a very indirect way and he addressed Allaah's uluww at the very end of his statement, which is the subject we will tackle next inshaa'Allaah, proving that He is a Jahmee in that regard, and certaintly not a follower of the Salaf, or al-Ash'ari, or Ibn Kullaab, or al-Qalanisee, or Ibn Mahdee al-Tabaree, or even al-Baqillaani, rather he is with the Jahmiyyah and Mu'tazilah.